Widen KY 236 (Donaldson Highway) from KY 3076 (Mineola Pike) to KY 842 (Houston Road) to improve capacity and support economic development. The proposed widening of KY 236 (Donaldson Highway) will provide sufficient capacity to support future traffic volumes. A portion of the proposed multi-use path will comprise part of the Cincinnati/Northern Kentucky International Airport (CVG) Loop Trail. 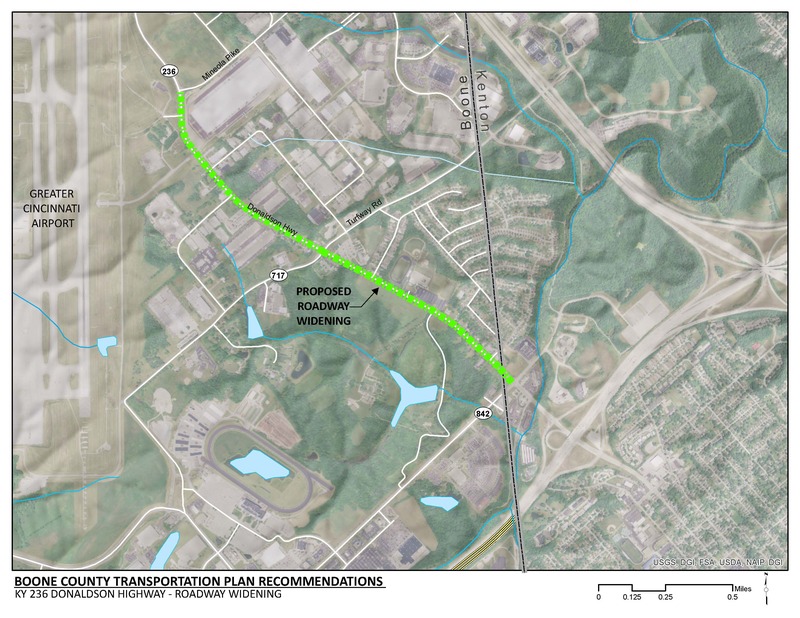 The proposed multi-use path will improve safety for pedestrians along KY 236. This project is consistent with Boone County’s overall goal of improving safety and connectivity for bicycles and pedestrians. Click HERE for a map of multi-use paths in Boone County. Industrial development within and around CVG is occurring rapidly. The construction schedule of this project and coordination with other improvements in the area will be essential to reduce congestion-related impacts to businesses in this area. KY 236 (Donaldson Highway) serves as a primary connecting route between I-71/75, CVG, and industrial development east of the airport. Existing KY 236 is a two lane facility that serves as a primary connector between the interstate and private industries. Future traffic volumes indicate that additional lanes may be needed to support future traffic volumes. Freight distribution activities at CVG is expected to dramatically expand which will significantly increase the volume of traffic on KY 236. As freight distribution development expands in and around CVG, it is essential to provide reliable mobility to serve these facilities. KY 236 serves a mix of schools, residential, industrial, business park, and commercial development. This type of development is expected to expand by the year 2040. The crash rate on KY 236 is 24 percent higher than the statewide average on similar roadways. There was one pedestrian related fatality within the limits of the project that occurred in dark conditions. KY 236 is a component of TANK fixed route 2x. The portion of KY 236 from KY 717 (Turfway Road) to KY 3076 (Mineola Pike) has been identified as part of the CVG Loop Trail.